This day has been coming for a long time. 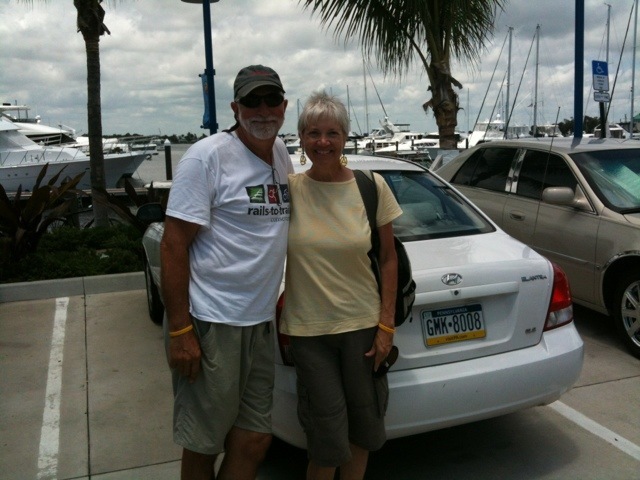 Today our yacht surveyor picked up our car. That’s right, the Humble Hyundai is gone. 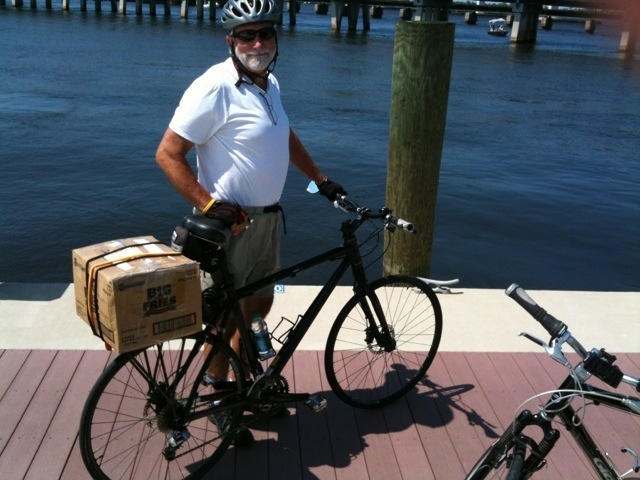 Now that quick little 5 mile drive to Publix is really a ride on the bicycle, and is going to take a while. Where the closest bank is I haven’t a clue. Yesterday we rode up to Fort Pierce to see Marine Connection Liquidators who really do have 8 acres of boat parts. Can’t happen again without a car. Everything gets difficult. I need to get a box to mail unneeded cold weather clothing back up north. Tough on a bike, and of course then it needs to be mailed. You get the picture. Yes, there are workarounds but everything is easier with a car. Like an unexpected drive up north. We can’t do that now, but we sure wish we could. “Never postpone a pleasure.” Anyone who knows me has heard me mumble my mantra, over and over. Never postpone a pleasure. Its meaning for me has migrated over the years, as you might imagine. You say these things and you think you know what it means until life or more properly death has its way with you and yours. We come with no expiration date. There are no guarantees. Marce and I have experienced what we now call the Year of Death. Nine friends or family died in the space of a little over a year. Some violently. Some could fight no more. On the day the Hyundai left I got two text messages within 30 minutes about my two closest friends. Both in the hospital with serious heart problems. My oldest friend is in a coma. Never postpone a pleasure. Pain and disappointment will always be there waiting. Never miss an opportunity for joy. It doesn’t get any more real than that. Our life has changed and we can’t respond to events like before, like jumping in the car and driving to be with friends in need. But we never postponed a pleasure with them. And we’re not postponing it now. Very thoughtful post, Jack. Thank you. SO PROFOUND AND TRUE. Sue has been a clinical nurse before being a nurse practitioner, and met so many embittered over waiting too long. The joy in life is not to be postponed. As a trial lawyer I heard a lecture of a wise 80 yr old professor once who said, “You all think some day you will win that huge case for a client and be able to take it easy. We are all like Sisyphus pushing the bolder up the mountain, and just before we get to the top it rolls down and we labor on again and again to push it up. The joy in life is on the way up the mountain, not at the top. As the English saying went, “The Road is Better than the INN”. Live life to its fullest in the present. As to the car, we finally settled on using our American Assn of Retired Persons id (cost of membership in single digits) to get lowest rates from Enterprise Rent a car. They always pick us up and AARP rates are minimal. We use an American Express Green Card that auto-deducts from our bank account as AmEx has a captive insurance company. They will sell you a CDW policy on it that gives you $100,000 of CDW for a uniform charge of $25 each car rental and its first party insurance, does not go back on your personal policy… and lasts for up to 40 days on the one charge each time. Much much cheaper than any other rental coverage I have found. I am a lawyer and appreciate the extra protections! We are enjoying your discovery of the dreamed of life!